In 2015, Planned Parenthood . . . help[ed] millions of people pursue their dreams and realize their full potential. That’s one of the “achievements” listed in Planned Parenthood’s 2014-15 Annual Report. The irony makes you a little nauseous, doesn’t it? The new report is attractive, with pictures of women who could be your neighbors. But here’s the bottom line: Planned Parenthood’s hyped “health care” services are down while their net assets are up. Let’s see what Planned Parenthood’s been up to from 2010 through 2015, according to their own annual reports. PAP tests decreased 65%, from 769,769 to 271,539. Breast exams fell 51%, from 747,607 to 363,803. And remember, the number of mammograms they provide has always been zero. Goose egg. Nada. Prenatal services dropped 44%, from 31,098 to 17,419. Total services decreased 14%, from 11 million to 9.46 million. Their number of patients dropped 17%, from 2.99 million to 2.5 million. But money? That’s a different story. Government grants and reimbursements—compliments of your tax dollars—climbed 3%, from $538.5 million in 2010-11 to $553.7 million in 2014-15. Planned Parenthood’s net assets rose 50%, from $1 billion in 2010 to $1.5 billion in 2014-15. 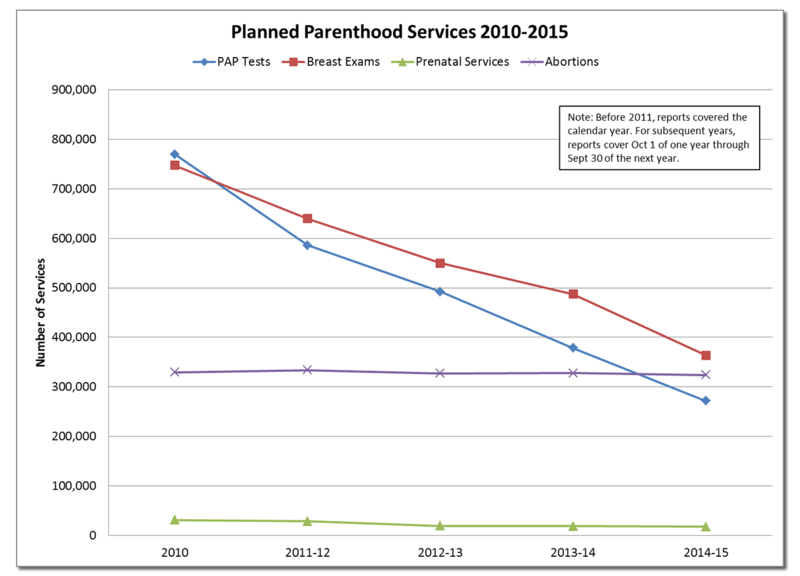 Chart showing declines in Planned Parenthood’s services. Click to enlarge. And while a complicit media has helped Planned Parenthood channel Chicken Little—The sky is falling!—about women’s health care if their funding is cut, the reality is that Planned Parenthood’s 59 affiliates run just 661 sites in the United States, mostly in urban areas. On the other hand, your tax dollars also fund more than 9,000 Federally Qualified Health Centers (FQHC), a specific designation for sites that serve high need populations. Almost half are in rural areas. They’re open to all residents, regardless of insurance or ability to pay. And unlike Planned Parenthood, the FQHCs treat the whole patient, from well-baby care to dental needs to mental health services. Counting other community health centers that receive federal funding, the number jumps to more than 13,500. And remember that patient count Planned Parenthood is so proud of—2.5 million? In 2013, the FQHCs alone saw 21.7 million patients. Including 424,376 patients who did get mammograms. Making money by killing babies and selling off their parts. Taking a chunk of your paycheck. This entry was posted in 2015, Planned Parenthood, The Latest by Bradley Mattes. Bookmark the permalink.